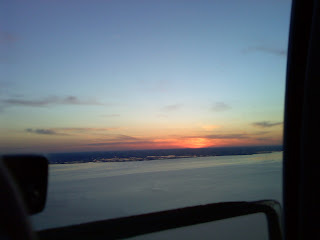 A beautiful sunset, the start of a very productive flight. I took to the sky this evening with MikeB as my safety pilot, trying to knock out a few approaches and a night take off/landing to remain current. The plan was to depart Wilmington (KILG) and head over to Millville for some fun. We were soon launching off two seven after turning down the offered runway niner that had a quartering tailwind, what was the tower thinking. Anywho, off to New Jersey for a round or two of approaches at MIV. I'll get this out of the way first by acknowledging Millville radio wasn't to bad tonight. Mike did joke about ME having to deal with THEM. Lets get started. I first shot the RNAV GPS RWY 14, went missed and climbed out to the ZUNIE intersection then broke off for another approach. Next up was the RNAV GPS RWY 32 Approach. Mike and I role play ATC for vectors which is always great radio work practice as I head to the Initial Approach Fix LAYIB. 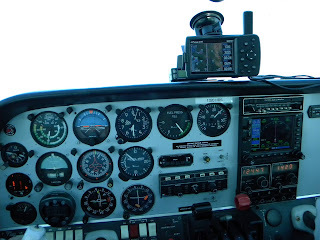 The role play with vectors really helps, you are flying the plane, interfacing with the garmin 530 with new direct to intersections and maximizing the workload, multitasking as a.....ahemmm...I affectionately call it. I admit that I blew the Procedure turn but recovered, for what that's worth. The 530 tells you the correct entry to use but I went with a direct entry. 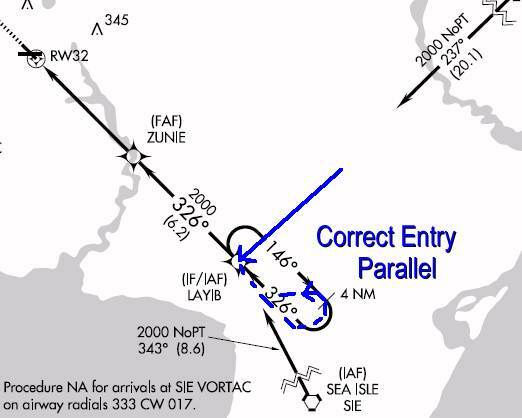 The correct procedure would have been a parallel entry. I did travel in bound on the 326 degree radial tracking solid prior to crossing the LAYIB intersection and made a nice approach from that point. Next up was the ILS RWY 10 for Mike and I both as I got to safety pilot after my approach and enjoy some of the night view. Mike was rock solid briefing the plate and getting back to the scan, always maintaining heading and altitude. I need to work on picking up the pace of my scan and not fixating. We both decided to head back to ILG and shoot the ILS RWY 1 then call it a night. I contacted Philly with my position and altitude requesting a practice ILS 1 approach for Wilmington. I acknowledged my squawk code and altitude then followed vectors for the approach. 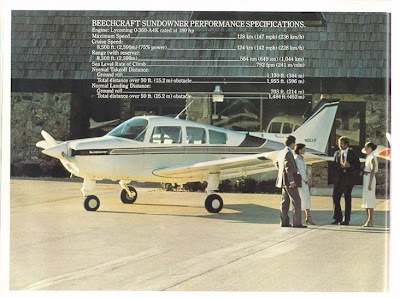 Philly then asked if I was a BE36 Beech Bonanza), wishful thinking, I thought to myself and advised a Bravo Echo two three (Beech Sundowner). I was about 4 miles from intercepting the ILS and had received my final turn to do so when I configured for 90 knots and a notch of f laps. 2200 RPM is level flight with a notch of flaps and we were on our way. Localizer is alive as I turned to the airport. A bit quicker then needed which required me to slow my turn and let the localizer catch up, yes I was a bit anxious. Philly turned me over to the tower and I made my call, Sundowner 6708Romeo on the ILS in bound for full stop. I did a good job tracking the ILS as I set my power to 1900 RPM for a 5-6 hundred foot per minute descent. I needed to adjust for the glide slope a smidge but overall not bad as I looked up at 400 feet and continued in to land. Good practice as I work my way to the check ride. I may be up Thursday night for another few rounds, we shall see. Friday's plan is to explore New Garden for a possible relocate of the plane (only 15th on the list for a hangar). Friday at some point I will run Mike up to Lancaster for the Cirrus then swing over to Wings (KLOM) for the PACC happy hour. Saturday is the first scheduled beach run of the year. Yes, I know the water is still freezing but Mary wants some beach time to work on the tan. Sunday will be Easter dinner with family but if I'm lucky and the timing is right I may be able to sneak in some flight time. I received an Email from a reader today, it seems we sort of crossed paths yesterday. 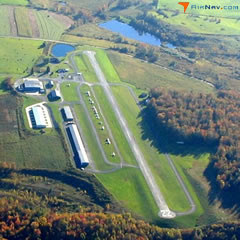 While Mary and I flew to 9N3 via Allentown and Wilkes-Barre, Tim was flying from N87, Trenton-Robbinsville Airport in Robbinsville, NJ. 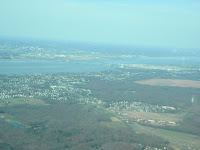 Tim's flight path brought him through Allentown's Class C, Charlie airspace and over Wilkes-Barre, PA on his way to KIAG, Niagara Falls International Airport in Niagara Falls, NY. Tim had mentioned he saw the Niagara Falls trip on our "planned trips" link. He provided a great teaser photo from 3,600 feet over the Niagara Falls Scenic Loop. Yes, this is on our list of things to do, places to see coupled with a weekend stay at the Embassy Suites Falls View. The Canadian side is really nice. Just about every major hotel takes advantage of the shuttle bus to get you around town. The last time Mary and I were at the Falls we didn't touch our SUV all week. We can't wait to "fly" back this summer! GREAT SHOT - THANKS TIM!!! 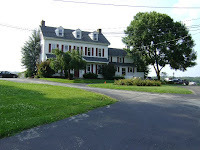 Mary and I decided on visiting friends north of Wilkes-Barre, PA in a small town just a short drive from Seamans field. Pete and Lorie live in South Gibson, maybe 15-16 miles north east of 9N3. Pete agreed to pick us up at the airport so we decided on a 10am meet. Fast forward to this morning and we are dragging tail feathers getting out of bed. The temps have dipped down into the 30's which is a big jump from the 60= degree wx of the last two weeks. Eventually we get moving and head to the airport. I called for fuel prior to leaving the house so that was taken care of. We made a quick stop at McD's for the breakfast McGriddle sausage wrapped in pancakes along with a bottled water and soda for Mary. We motored south and headed through the gate on to the ramp around 9am. It was a bit nip with temps now hovering around 38ish. I prime 08Romeo and get started with a nice low idle to bring up temps. Electronics are set up and I even fiddled with the Zaon traffic system in hopes of it knowing who I am and not giving a ghost reading of the plane. I made the call to the tower and was cleared to taxi for runway one four at kilo 5. Run up was good and we were cleared to take off, 08Romeo loved the cool morning air. Once clear of Wilmington's delta air space I contacted Philly approach for flight following. The exchange was smooth and quick and I was cleared to 3.5, no magic words at this time. As we held our course, which was going to put us directly over the Pottstown, Limerick cooling towers, Philly said the magic words and cleared us through the Bravo then immidiately handed us off. I checked in with the next Philly Approach sector, Sundowner 6708Romeo, level 3,500 requesting 6,500. I got the updated altimeter reading and was cleared to 4,000 on course. Hey that worked, he sounded kind of busy with traffic. In just a few minutes he cleared me to 6,500. Philly handed us off to Allentown and they in turn handed us over to Wilkes-Barre Approach. We flew right over the KAVP runway two two approach. AS we cleared the runway area approach had a traffic alert for departing traffic runway four which I soon picked up at our four o'clock climbing out. We crossed Bald Mountain and could see Lake sheridan in the distance. I was settimg up for 9N3, runway four and had the wx update from KAVP. I requested to start my descent and it was granted with the typical, maintain VFR. I had the field in site and canceled Following so I could listen to the local traffic. One other aircraft was inbound so we traded calls and both got it figured out as we made our way in. The runway is 2500 feet and I wanted to be on the numbers today. Base to final was a tad fast so I pulled back more power and pointed the nose at the runway. A short but nice round out with good stall horn and I touched each main separate followed by the nose wheel, it felt pretty good. The runway is short and a bit bumpy. Pete and Lorie had just pulled in and their son (18 months)PJ Jr., was taking it all in. So nice to catch up, it's been way to long. I checked in at the office to let them know I would be leaving this afternoon then we headed for Pete and Lorie's. South Gibson is a sleepy little town with a blinking light, a small diner and some shops. Their log cabin is set with the background of the mountains and a nice stream at the foot of the hills. We walked the property for a good bit along with their two dogs Bailey and Brandy, hung out and chatted trying to catch up on family, work and baby stories. We loaded up and headed for a nice tour of the area. It's a good thing Pete didn't drop us off, I had no clue where I was. We eventually made a stop at the Mountain View Restaurant for a late lunch. Great place! The prices were like stepping back in time. I had a chicken dinner with mashed potatoes for $5.95, Mary and Pete had liver and onions (yuck!) $5.95. Lorie had a cheese burger and PJ had spaghetti with meatballs. Warm rolls and a basket of sweet bread that we all split up to take home. Mary and I decided that we would head back to the plane so we could get in the air. I guess it was maybe 4pm when we pulled out of the tie down and taxied out. We waved as we went by heading out to runway two two. 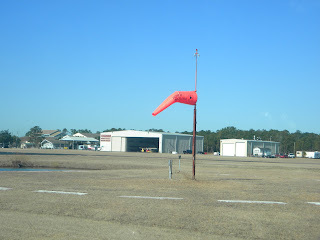 The wind sock was dancing around but for the most part favored our runway of choice. I had a heavy fuel load so I added two notches of flaps for m y departure. 08Romeo was in the air in less then half the 2,500 feet and pointing towards the mountains between us and Wyoming valley. A smooth uneventful ride home with flight following the whole trip. We shut down on the red eagle ramp at 5:15 and quickly buttoned up the plane. I did clean the windows with the fresh can of Plexus that I had ordered, it did a great job. Finally home and taking care of the zoo. We are going to kick back for the night so I can type this post and Mary can type away on facebook. I would have had more pictures but I forgot to check camera batteries and I only had two of the four double A's required in my flight bag. I even had the video camer with us but never took the time to mount it or plug in the audio. Better luck next time with some additional prep time and not just the camera phone to work with. I have referenced the Adlog™ system multiple times over the last few 08Romeo history posts. 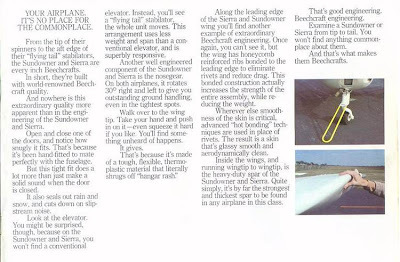 I wanted to take some time and share a bit of info about that very system offered by AeroTech Publishing of Southhold, Long Island, N.Y. 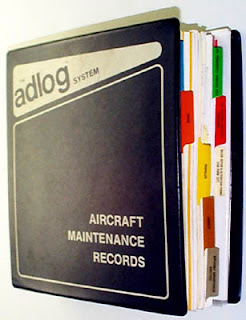 The Adlog™ system consists of a three-ring binder with 13 color-coded index tabs (14 for FAR 135 aircraft). 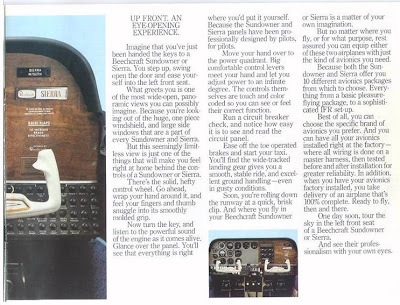 You can purchase a 2" binder which is recommended for older aircraft with a lot of history. I purchased a 4" binder from Staples, copied the Adlog binder logo and slipped it in under the front cover plastic of the binder I purchased, it looks fine. 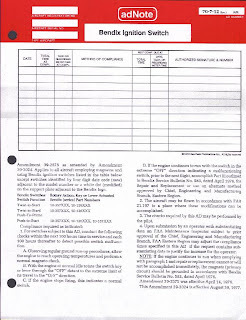 The color coded index tabs include divided tabbed sections for General Information, Aircraft Inspection Status, Airframe, Engine, Propeller and Avionics logs, Applicable Airworthiness Directives index, AD's Permanently Complied With, AD's Requiring Additional Compliance, and sections for Major Repair & Alteration Forms (FAA Form 337), Wt & Balance Papers, Factory Service Notes or Bulletins and 8130 Return to Service Paperwork. The cover of each logbook is color-coded to match the corresponding index tab, so it's pretty hard to screw up refiling a log book in the wrong section of the binder. 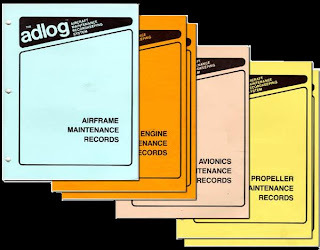 Each of the logbooks are 8½ x 11 inches, so they provide ample room for the stick on maintenance entries along with room to staple in yellow tags and other necessary forms and documents that may be required. AdNote™ data pages combine the complete text of each air-worthiness directive with its associated maintenance compliance form, and are divided into non-repetitive and repetitive AD sections that let you know instantly of compliance status. A computer search is included, for all airframe, engine, propeller, and appliance airworthiness directives that apply to your aircraft. Each year prior to your annual inspection, a new updated AD computer search is provided. The first years subscription service to the adNotes™ is included with your purchase. After the first year the subscription service for the adNote and yearly updated Airworthiness index is $25.00 for single & $28.00 for twins. It's time to finish the Instrument rating. This past Thursday with Safety Pilot Mike along was a great start to getting back in the saddle. 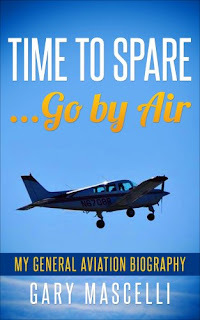 Our discussions about instrument flying left me with some things I need to polish up on and now I'm more focused than ever. I need to get aggressive with altitude and heading, this is not VFR flying, this is precision flying with no room for error. Bouncing ideas and talking about procedures really helps get the mind back in the game, it's all about precision flying. This afternoon we had the chance to meet up with fellow POA forum members AdamZ and Lee. I was a tad late to Chester County(KMQS) but did finally make it there in time to receive a landing grade. I shot the ILS 29 approach into gusting wind conditions which provided plenty of float but for the most part an on center looong landing. Once all together we walked into the Flying Machine Cafe' for lunch. AdamZ had a Ruben, not sure what Lee had and Mike and I each had a salad. After some great hangar flying we all headed back out to the ramp. 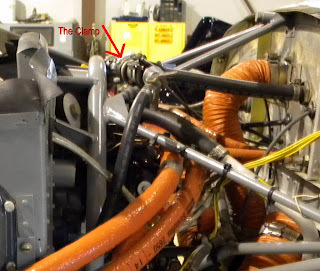 I thought I would help out a Cessna that taxied in by bringing out a set of chocks. When the pilot got out he called my name, I had to look twice. 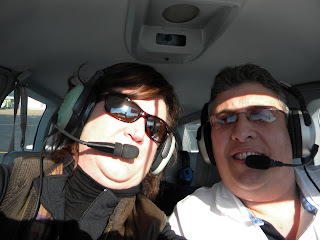 The pilot was Keith, one of the men that work at Cecil Aero at 58M, what a nice surprise to see him and his wife. Mike and I saddled up for some additional approach work. We role played ATC as I set up for GPS 17 into KEVY, Summit Airport. The GPS approach was fine and just prior to the MAP we went missed. A brief approach review and then we were off to KILG for the ILS Runway 1 approach. 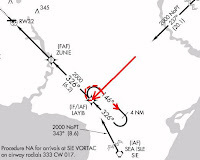 Wind's strongly favored one niner so we terminated this approach with a circle to land on one nine. No pictures from today, this IR practice time is all business and I want to hold on to what Mike said out in the parking lot. Shooting the approach is like fighting a five mile battle....stay focused. Let me add don't quit....Me Quit? I don't think so, it's just not my style. I hope to get some additional hood time this week but that will depend on the wx. One side note.....I broke the 400 hour mark today!! Hard to believe, in just 3.5 years I've come this far. What a perfect teaser for Spring! The Mid-Atlantic wx this past week has been fantastic! I got some IR work in, Mary and I had a date night flight and today we decided it was time to take our two dogs flying.We went back and forth about a place to go and we even considered just taking a short local flight to see how they handled everything. We came up with two locations; Ocean City NJ and Cape May NJ. Ocean City would be fun, short hop and close to the ocean. 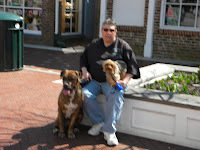 Cape May provided the same short hop and plenty of space through out the airport complex and industrial park that we could let the pups have fun. The decision was made to head to cape may. 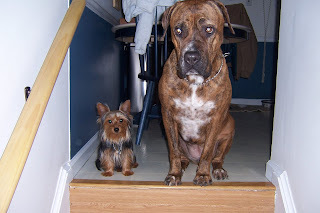 For those of you not familiar with our family let me introduce Maggie our Italian Mastiff, obviously on the right and Rudder our Yorkie, yeah, the little blip there on the left. Our crew loves to hang out here at home, sometimes on patrol but most of the time doing something goofy to make us laugh. The Maggie girl is 115lbs of cuddle bug, she honestly thinks she is one of the cats and loves to rub and lean on you as often as possible. The little guy is a bundle of energy and zooms around the room at full speed when he is ready to play. When his batteries are low he is the first one to crawl in your lap and sleep, heck, he'll sleep curled up on a pillow or will take your spot on the couch as soon as you get up. Mary and I headed out to Angels for breakfast, a perfect opportunity to plan our day and plot how we would handle the two new flyers. With two eggs over medium, pork roll and rye toast consumed it was time to get this party started. We packed the SUV with a moving blanket, a backpack with the collapsible water bowl, 3 bottles of water, handiwipes, paper towels, dog treats, a leash for each and plastic bags. 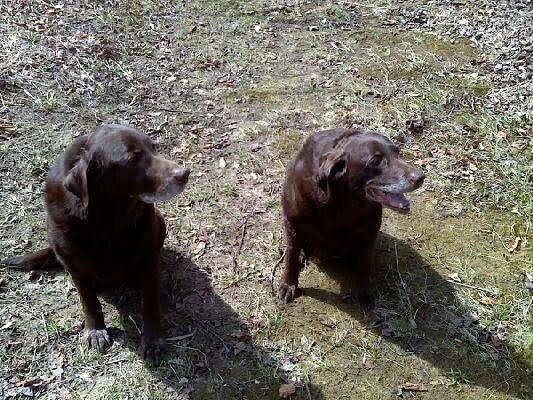 I opened up the back hatch/door and they came running from the house like it was on fire, the little guy barking up a storm. The rule is no boarding until they take a mandatory potty break. It's a riot they want to jump in but I point to the yard and after a stare down they both humor me and head to the grass for a pit stop, rules are rules. We arrive at the airport and as planned pull the SUV on the ramp so we could better contain the pups and Mary can help with the pre-flight activities. I unloaded the plastic container from the baggage area that has our oil, a few tools and cleaning supplies. 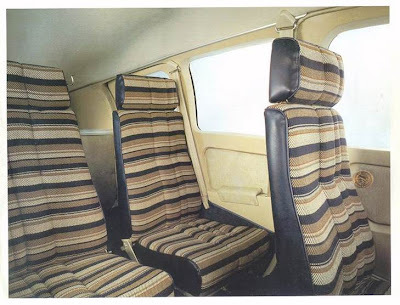 I also removed the pilot side back seat so Mary could have easy access to them between us in the front seats. The moving blanket went in and I finished my normal pre-flight. We were set for the test, could Maggie jump in through the baggage door. 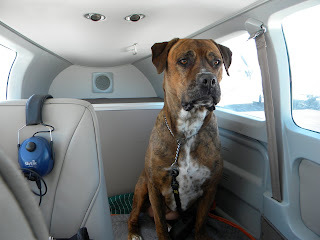 I placed my hand on the edge of the floor at the door and gave her the kennel command, one jump and she was in the plane looking out the rear window at me, as if to say whats next! The little dude was handed in and I closed the door. Mary was in the process of climbing in the front right when Rudder boy went between the seats out the right door and down the wing on to the ramp. His time on board was very short, he was outta there. Mary gave him a scoop and put him back in the plane then closed her door. I had walked in from parking the vehicle and was almost to the plane when our ramp neighbor fired up his Sierra. I climbed aboard and asked how they handled the plane starting and Mary said they didn't even notice, that's a good sign. My checks completed it was now time for us to start. Clear prop got their attention and 08R came to life. Interesting, not much of a reaction. As you can see from the picture above Maggie looked like she was all business and ready to help out. This has to be one of my all time favorite shots of her in the five years we had her, it captures the best of the breed, squared off ears and alert look. The Ruddernator was everywhere, not quite sure what the heck was going on, just a bit confused. As Maggie settled down he stuck close by her, hey safety in numbers. We taxied out and received clearance to take off runway niner and pointed 08Romeo into the wind, the adventure is about to begin. 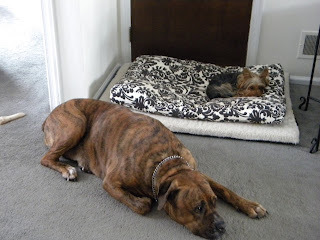 Both dogs were quiet, and pretty much either laid down or in Maggie's case looked out the window. As we crossed the Delaware river there were a few bumps and Mary noticed that Maggie looked around. We didn't get the shot but Maggie sat up and looked out the window, and for you dog lovers you'll understand, she squared out her ears cocked the head from one side to the other and just stared out the window, it was priceless. The trip to cape may was maybe 25 minutes and we were on the ground. 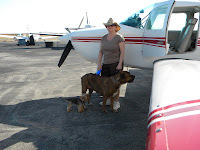 We secured the plane and headed towards the FBO (Big Sky) and just for the heck of it I asked if we could taxi into town with the dogs. The man working said the taxi's would take all of us, it's not the first time with dogs, although that one is pretty large. The van pulled up and the guy asked does that one bite, pointing to Maggie, well I said, she does have teeth but no she's plenty gentle unless of course you grab her mom. He said that's not a problem. However I said, if you grab me she would most likely not notice, he laughed. We headed into town and got dropped off at a big gazebo one street from the shops. The place was really packed with people taking advantage of the wx. This would be a great test for our pups. I asked Mary if she felt comfortable handling Maggie and she said yes. It only takes an instant for a dog to lunge or pull free although Mag is great on the leash and has never once displayed any tendency to act out. I got to take the little fella, yep, me and the Rudder man, what a foursome we were. Maggie was perfect, all the training we did really paid off. She listened very well, let everyone pet her from granny to kids as only as tall as Maggie. Rudder had a following too and he did very well. The best part of all is when people walked by and Maggie does not even reach out to sniff, that made me happy. Nothing worse then a dog in public wanting to sniff every hand, scrap of food or other dog that walks by. There is a place for that stuff and it's not around other people. I guess we spent an hour or two strolling along while Mary checked out a few shops. We headed back to the gazebo and called Ace Sharper for the taxi ride back to the airport. 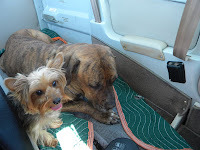 Both dogs climbed in the van and quickly settled. The question now would be if Maggie wanted back in the plane. Rudder had no choice I could put him anywhere. We let the dogs stretch a bit in the grass areas and gave them a last drink of cold water before we boarded. 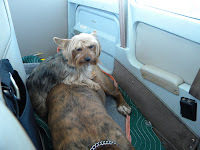 Mary kept the pups in the shade while I packed our backpack and situated the baggage and back seat area. Ok time to get Maggie in the plane. With a simple touch of the baggage floor and a kennel command she jumped right in, what a good girl. Rudder followed as I lifted him on board. Mary was in and I finished the pre-flight. Cape May (KWWD) was very busy today. The ramp at the terminal was packed and there was a lot of planes and action at Big Sky. We taxied out and had another aircraft coming head on so we moved right towards the wide open ramp and passed each other by. I gave a wave and got nothing back, sheeesh like a simple thanks wave would have killed the guy. I followed an Archer out to runway one nine and we turned in unison to point into the wind for our run-ups. By the time I was at the hold short ready to go there were four other planes waiting behind us. Three planes had landed before we got the chance to depart. Finally rolling on the runway and going full throttle, I hated shutting off the blower fans for the cockpit. At 3,500 feet it was 60 degrees and the vents were streaming in cool air. We have six headliner vents, two panel vents, two leg area vents up front and two back seat floor vents, needless to say we had good flow. Maggie picked a spot and passed out, Rudder found a spot between the back right and front seat. He positioned himself with his back feet on the floor, body against the seat face and front feet and face curled up against my flight bag, I guess it worked for him. 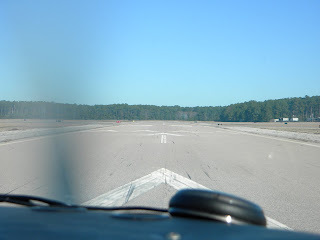 Once on the ground I taxied to red eagle and shut down. I decided I needed to wash the plane since the birds used 08R for target practice. I gave her a quick scrub, loaded the seat back into position and the regular supplies we carry. 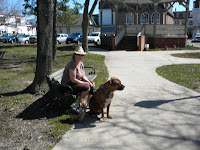 Mary had the back hatch open with the dogs relaxing in the shade taking advantage of the gusty winds that were now blowing pretty strong. I fired up one last time to taxi to our tie down and secure the plane. I ordered fuel and we put the cover on. As we pulled away from the airport we decided on pizza for dinner. We called the order in and headed to the house. Once home the dogs passed out, they were beat! We ate dinner, I unloaded the truck and we kicked back to watch the NCIS marathon. A fun day out with my Bride and now we know both dogs can fly without any problems. Friday night Happy Hour flight! Mary and I decided that it would be much more fun flying (30 minutes engine start to shut down) to Wings Field (KLOM) then driving (1 hour minimum in blue route traffic). I had plenty of fuel from last nights flight and didn't burn but a few gallons on my maintenance flight this morning. I already sumped the tanks this morning so I was good to go and the rest of the pre-flight was perfect. I also left the cover off knowing we would be heading out. I contacted the tower and was cleared to taxi for departure. 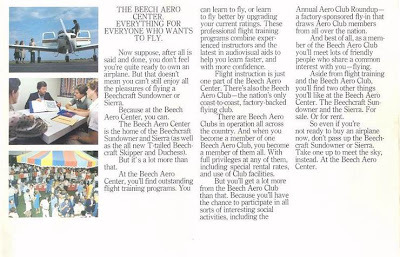 Mary and I noticed one of the club members flying the Archer N28679er. Dan and his wife were loading baggage he was getting ready to fire up as we passed. I heard him pick up his IFR clearance to Ocracoke. We launched and pointed towards Wings riding out some bumps as we passed under the Philly Bravo shelf. I monitored approach on 119.75 and heard 679er check in as he requested direct Smyrna (ENO). He got the direct after traffic passed and climbed to eight or nine thousand feet, I can't remember. I had the PA turnpike under me and had the field in sight as I positioned for my entry to the downwind over top the quarry. Base to final adding the last notch of flaps and the crosswind pushes me left, slight power correction and I'm down. 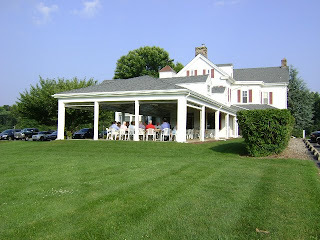 That was not pretty, alignment points deducted, smooth points added, grade C.
We secured the plane and walked across to the Philadelphia Aviation Country Club for happy hour snacks and (for me) a cool ice tea and for my Bride a glass of wine. It was relaxing to sit outside and watch the planes come and go and spend one on one time with Mary. I reported to work early this morning in hopes of getting out two RFP's (Request for Proposals) on contracts that are ready to roll. The Email drawing files I was waiting on did not come, but the remaining paper work was ready. While I waited I placed a call at 8am to Cecil Aero to see if they had an open slot to check out my Vacuum troubles from last night. Keith and I chatted and he noted my info so Roger could call. It was set, I had the ok to bring Juliet in for a check up. I was packed and out of the office in a blur headed for the airport just a short ten minutes away. I had left 08R uncovered last night so I could make a quick get away this morning. I sumped, pre-flighted and climbed aboard. Juliet comes to life and after receiving clearance we are go for taxi. I was cleared to take off from runway one and turn left on course. It's a very short hop to 58M, and I had the airport in site positioning to overfly the field and enter a midfield left down wind for runway three one. A nice base to final followed with a gentle landing and we are enjoying the sunshine as we roll clear and announce. Keith marshaled me into park and I shut down. Roger and I pulled the top cowl and took a look. He said this one is an easy fix, the hose clamp is loose and the hose is pulled off the pump. Ugghh.. I felt like a dope. I didn't see anything looking through the oil access door this morning and I know one can not see everything but....I just felt dumb. Roger, always the gentleman, said you made the right call getting it in here. If you're not comfortable stop in and let me check it out. We buttoned up gave it a test run then shut down. Roger invited me in for coffee so I walked through the shop, said hello to Frank and chatted a bit with the guys. I asked Roger what do I owe you this morning, he said, go fly! How could I argue! No cost today but knowledge gained. With a few of my fellow pilot friends knocking out their Instrument Rating (congrats to Bob and Jeff), I am really starting to get the itch to finish up. I feel comfortable flying 08Romeo and think I am ready to get back on the horse. I need to practice partial panel, unusual attitudes, timed turns and in general a good solid review. By the numbers I have met or surpassed all of the IR criteria. I went flying tonight in hope of shaking off the rust with my friend and safety pilot Mike. The original plan was to shoot some approaches, holds and in general load up and expand the multi tasking-ability. We started out with some practice area time with "role play" ATC and some basic Instrument flying. A good review of working my scan with primary and back up with some amended clearances, non-published hold and finally shooting the ILS into KMQS, Chester County. showed. I was high and dropped in, not used to that sight picture but got 08R on the ground. Mike and I had dinner and did some review on flight strategies (as I like to call it) working the flow, being consistent and safe. We finished up and headed back out to the plane for more torture.....I mean practice. We started up 08R and taxied out for my run up and noticed my vacuum gauge not functioning and my low vac warning light was on. I positioned for my run up and everything else checked out ok. The vac came up once rpm's were above 1900. 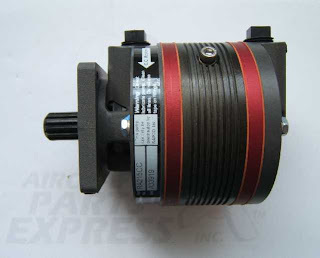 Once rpm's fell below 1900 no suction. A quick in cockpit review/discussion of FAR 91.205b follows. We were good to go and the wx was on our side. It was a short hop back to Wilmington and we were soon off the ground and pointing south. I did bring up the Garmin 496 screen that has the "six pack" as a back up. Once cranking out higher RPMS in flight everything was fine. I contacted Wilmington and as instructed reported left down wind entry at mid field. Adding to the excitement was some carb ice (more on this later)on base to final and we now have a complete training session. A nice landing and roll out to Kilo 4 and we're home. I can't wait for the next flight! I've managed to find an additional two owners who I can not seem to make contact with, at least not yet. I am however, getting to know the telephone operators in and around Dallas, TX. While putting my new Adlog system together I must have read through every scrap of paper associated with the plane that was passed along to me (for the third time). The two new owners added to my list are the Wilson's, Kyle & Susan(TX)in partnership with Brad Benat and Rudolf Fink (MO). here is the latest list/line up of owners. Took possession from the factory, Ken Miller (GA). Next up by my best guess would be Robert Slack (MS), Rudolf Fink (MO), a ferry flight in June of 1995 to somewhere I can't make out and for what reason (I think it was out of annual) I'm not sure. 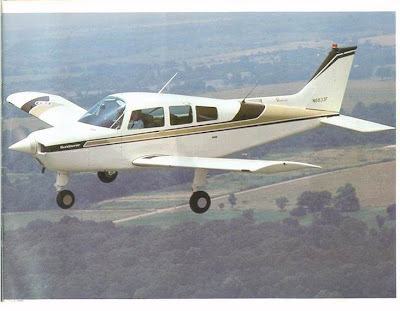 From this point I think it went to Dave M (IN) then a dealer (maybe Million Air Evansville, IN) sold to Jean Michael (IL - September 98) and somehow back south to Texas. 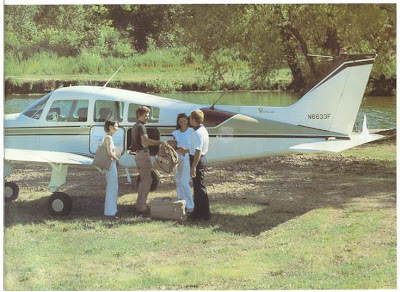 I think this is where Kyle Wilson and Brad Benat came on board then eventually sold the plane to Emery, the man from Palestine, Texas that I purchased 08Romeo from. I believe this is the order according to endless search of the mountain of papers, for all I know it could be bass ackwards! I have receipts from annuals back to 1981 and between the log books and receipts for work I can honestly say I wish I had a dollar for every light bulb replaced. I did find an old flyer advertising a reduced special offer for annual service at $17.00 and hour, ok who wants in on that price???? Again, I'd love a dollar from everyone wanting to get in that line! 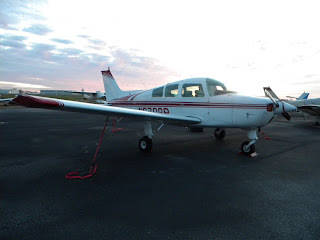 I'm working on posting that flyer and a few pictures sent to me from Dave M. I must also mention that Dave M now flies a knock out Beech Bonanza, wow, a sweet looking aircraft to say the least, here is Dave's current ride. Thanks for all the history and sharing the pictures of your Bo. It was a rainy on Saturday here in Delaware so it provided me some extra down time to further investigate 08R. I did manage to track down the original owner Ken Miller. I received a return call from Ken on my way to Cape May this morning to in fact confirm he was the first owner. After reading his bio I know now why Mary and I were so drawn to 08Romeo. Ken is a big time, ok really big time animal lover. Ken Miller is the man who provided the beautiful Golden Retriever "Duke" on the first series Bush Beans commercial. Here is a short snip from his Pet Lodge Pet Resort web page based in Georgia. Ken's dogs were known as the Jim Dandy© Dogs for 9 years, until Alpo© bought out Jim Dandy©. During this period, Ken was responsible for supplying the dogs for all of Jim Dandy©'s commercials and photographs for pictures on the dog food bags. As of 1995, three of these pictures are still on the Jim Dandy© bags. Ken's golden, "Mambo," is also known as "Duke," the talking dog on the Bush Beans© commercials. Ken has supplied dogs for over 120 TV commercials, plus approximately 35 still shots, for a wide variety of sponsors. Ken sounded almost as excited as I was to finally make contact. Ken obviously sold 08Romeo but went on to own two other aircraft. His travels took him to the Bahamas and Caribbean. 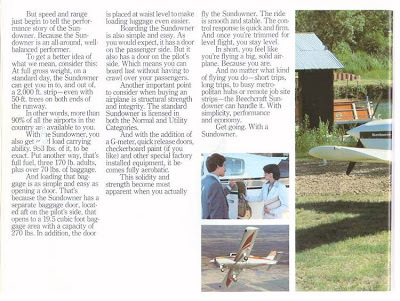 Ken traveled a good bit in our Sundowner back in the early 80's while working to finish his show dogs, mission was accomplished. Of course our discussion drifted right into dogs, rescue flights and finally back to planes. I promised to send him my blog link so he can see 08R in her new colors, panel and interior. One of the really strange moments came when we talked about his first venture into starting his Pet Resort, it was called Cloud Nine. This really took me for a loop as I explained our Friends passion for animal rescue flights and his Non-Profit is Cloud Nine Rescue. I think Ken even did a double take on that. A great time chatting and filling in another link in 08Romeo's history. At least she is used to having tailwaggers along for the ride. More to follow. 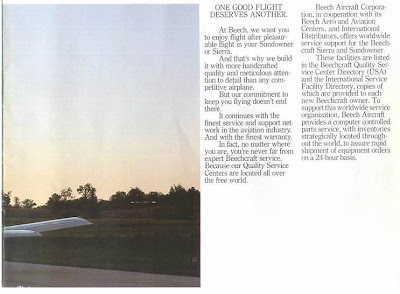 I was reading through various downloads on the Beech Aero Club web page when I stumbled across a post by a fellow club member Gerald Jackson that provided a 1980 Sundowner/Sierra sales brochure. Here are a few pages that I turned into .jpg files. I decided to take off today and enjoy one more day of beautiful flying wx. I placed a call to Cecil Aero to see if Roger could fit me in for an oil change. No problem, the earlier the better he said, I was on my way! I headed to the airport and completed my pre-flight, loaded up my new Adlog and a few books for Jeff from 33N. Jeff was also getting his oil changed and keeping compliant with the ECI Cylinder AD that required compression checks. It was a bumpy flight but I actually had to open my fresh air vents, the first time since leaving Texas last October to bring 08R home. I landed with a tad bit of balloon but set her down fairly smooth. 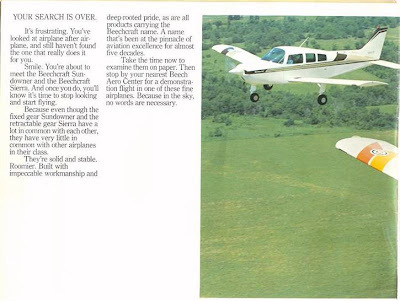 I taxied off and made my way to the Cecil Aero ramp where Jeff marshaled me into park right next to his Archer II, 93Z. Jeff had the oil draining and Roger was working on the compression checks. As they finished up Roger and I took the top cowl off and he hooked up the hose to the auto drain plug. Jeff added in his oil and started up for a leak test, everything was good to go. Roger repaired a broken wire on my nav light and I also found out my NEW LED light was burned out. While Roger and Jeff did the paper trail in the office I added seven quarts off 15W50 Aeroshell. No filter for me just a screen clean but this will change on the next service. I am going to add the oil filter add on by Teledyne Mattituck Services. I finished up and did my run up leak test with everything checking out fine. I took my new Adlog into the office and Roger made the first entry. With both birds ready to fly and both pilots eager to take advantage of today's wx the flight planning was under way. Jeff has yet to fly my Sundowner although he was quick to rib me about the time in his Archer coming home from Texas. Yep, he's right and so the plan was hatched. We would head back to 33N, Delaware Airpark and leave his aircraft and take 08Romeo across the Delaware Bay for lunch at Millville's Flight Line Restaurant. The hop was quick and bumpy! Jeff set us up on the left base for three two and I landed. We taxied to the restaurant and parked out front next to a Cessna. We each had the pulled pork special and it was really good. I must say I do miss the sweet tea I had this past weekend, I was spoiled I guess. 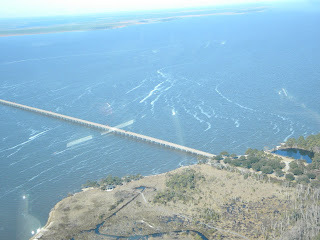 We launched off of runway two eight and headed back across the bay. I was on a long final as Jeff and I swapped control for me to land. It was an ok landing left of center but we were rolling out. Jeff and I parted ways and I taxied back for my departure taking me home. I listened to the Wilmington ATIS and called in with my position and intentions. Back home after a fun day of flying and I decided I should treat Juliet to a much deserved bath. I broke out the bucket and brush, spot cleaner for the grease on the gear and a few soft cloth rags. I'm embarrassed to say she hasn't had a real scrubbing since Texas. I promise to do better now that the wx is starting to point towards spring. The next nice weekend she will get a wax and the interior will get the treatment. She sure looks purrrrrty all clean and shiny. Today's numbers; five landings at four different airports and 2.6 in the book for a total of 397.2, Five hundred is a realistic goal this year!!! DAY ONE Friday, March 5th. Mary and I decided that the fantastic weekend wx forecast called for a flight. Where you ask, well it really doesn't matter as long as the sun is shining and I'm flying. We managed to narrow it down to either a few day trips or two nights in Nags Head, NC. 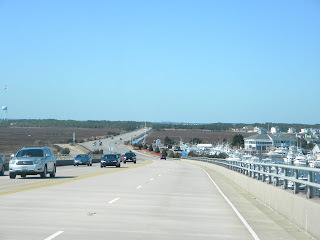 Nags Head it is, let the planning begin. I immediately started on my flight plan and wx review. Friday was looking iffy but I pushed our departure up from 10:30-11:00 to 8:30. The TAF (Terminal Area Forecast) was looking worse as the day went on for the first hour of the flight. We needed to clear Salisbury Maryland by 11:00 at the latest or it was going to be a reach. The other option was to sit on the ground and wait and launch late afternoon. The late launch was a no-go, not night current and with the freezing level so low I didn't want to stumble into wx and pick up ice. We loaded up the dogs who were going crazy running laps in the house thinking they were going for a ride. Well, they were going for a ride alright but it was a short hop to jail....er....ah...the boarding place. Maggie and Rudder were admitted, processed, whatever and we were headed to the airport. Mary and I have the routine down pretty good as we uncover, pre-flight and pack the bags. I fired up 08R and sat at low idle to let my oil temp come up, it didn't take to long. I was cleared to taxi to runway one via Kilo. With the run up complete I was cleared for take off and following my back taxi I turned into the wind and launched to start our vacation 2 day get-away. I climbed to 3,000 and tracked direct to the Salisbury VOR. Just south of Wilmington the soup was thick and I descended to 2,500 for a better view and to maintain VFR. Once past Dover the sun was starting to burn off the layer and visibility really opened up. 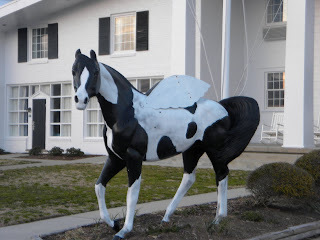 I asked approach for 4,500 and kept the nose pointed at Salisbury MD. By the time we passed Georgetown (KGED) it was pea soup once again. My visibility was down to five miles but I had solid ground contact. Mary started to feel ill when it's hard to make out the horizon so she closed her eyes and took a nap. I was handed off to Patuxent, then Norfolk when I asked for 6,500 now that the we were South of SBY and the sky opened up just as clear and blue as could be. I was handed off to Oceania twice and we managed to see two F-18's launch from the base and circle climb out to pass 15 miles off our nose in a tight formation and heading to the Giant killer restricted area. Very cool sight to see! Oceania handed me off to Washington center as I was about to cancel but the controller said he already handed me off so check in and update center. No problem thanks for the service. I contacted Washington center, updated the altimeter setting and advised I had the field in sight. 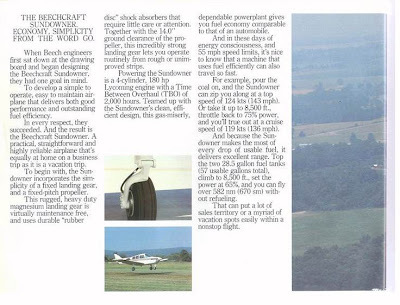 I was 17.5 miles north and was looking down runway one seven. I listened to the AWOS once again to make sure the winds hadn't changed and announced my position and intentions for Dare County (KMQI). I had some altitude to loose since I had requested lower a few miles back, actually with the last Oceania controller and now was letting down for pattern altitude 1050' now out of 3500. I made a call for a four mile 45* for runway three five and joined the pattern, oh baby the winds were kicking. Base to final was a fun ride with winds gusting out of 340*. There is a long displaced threshold here due to thew huge tress on final approach. This landing took some throttle work with the winds and I held off on adding that last notch of flaps until I was late in the flair. Super soft landing and a long slow roll out to a left turn out and taxi back to the terminal. A quick review and fuel check shows each tank at the slot which is 20 per side which means we burned roughly 17 gallons in just under two hours. Not to bad of a fuel burn and we had a nice tail wind with ground speeds of 130+. Mary went for the rental while I tied down and buttoned up 08R. I had the bags ready to go as she pulled up in a nice Explorer. I said wrong car we reserved a Ford Fusion for $50 a day, she said it was given out so we got the truck for the same price. We decided to get to the hotel and reserve a room then search for lunch. The plan was to head north and visit the First Flight museum. First flight is less then 15 minutes from the hotel so we made a first stop at a local watering hole, Awful Arthur's for lunch. Wow, supper crab dip that had some spice, my tongue, lips and even my ears were burning....but it was a good burn. After lunch we drove south a few blocks and turned in the park. Entrance fee was $4 per person and you could come back a second day. 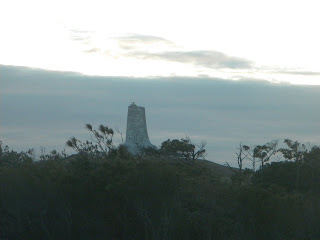 We drove around the monument then went into the museum. We had fun, took some pictures and looked at all the paintings on the walls. With the early start time, flight time here and lunch we decided to call it an afternoon and head back for a nap, hey, i t's vacation. Nap completed in a very cold room, our heater decided it was not going to blow any warm air. We called the desk and the maintenance man came right up, pulled the unit and replaced it. Wow, quick service and a really nice guy. The new heater was cranking out the warm air and quickly brought the room up to 70*. With the heat issue resolved we once again hit the road. The rental Ford Explorer is racking up the miles. We had no idea what we wanted but we headed north just in case, towards the all you can eat seafood or a steak house we had passed. We decided on JK's Steak and Seafood and it was a great choice!! Mary and I each had the fillet Mignon with a huge baked potato smothered in butter and sour cream. I passed on the asparagus but Mary took on the side dish and seemed to enjoy it. My fillet was cooked perfect, it was so tender you only needed your fork, unreal. It ranks at the top for taste with just a basic salt and pepper rub but the grill really sealed the deal. No dessert, we were way too full. We checked out more of the area and finally called it a night, heading back to the Surf Side. We each had the pleasure of sleeping in, no Rudder begging to go outside and no Maggie pacing the floor at 5:30 also wanting out. There were no cats to let us know their food bowl was empty and the phone didn't ring. 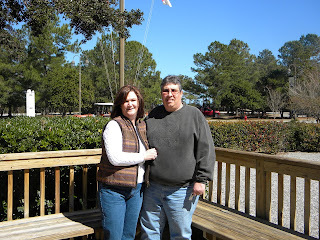 I think we got up around nine then got ready to head out to the Grits & Grill for breakfast. Is there anything better then Grits and sweet tea? I think not. A great breakfast of omelets, hot tea and coffee. Today we decided on hitting whatever shops were open in Nags Head, Kill Devil Hills and Manteo. With full tummies from breakfast we lasted into the afternoon despite Mary's attempt to walk every pound off me. We ducked into Darrell's for a snack and something cold to drink. Mary ate the fried oysters and I had the shrimp. A great quick snack or early dinner appetizer washed down with a Corrona for the Bride and a sweet tea for me. 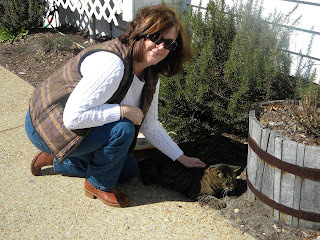 We hit a few more shops, checked on the local cats in the Roanoke Island Festival Park and scoped out some condos for sale and in general scouted the area for potential retirement living. We did manage to connect with two agents that provided some listings for us to look at. We really like the area, the people are so friendly and just about anywhere is a short hop to the ocean. Of course I would like to stay in Manteo closer to the airport. We finished up our long day and headed back to call it a night. We planned on a nap and late dinner but both had passed out. A bright and early start for us today as we get ready to make the 1 hour hop over to KLHZ, Franklin County Airport to visit family in the nearby area. The room was squared away in short order and we were ready to go. I had rolled out of bed early in order to finish my pre-flight wx checks and plan for the trip home.Having this small Dell computer has been great, easy to carry, performs all my flight plan tasks and allows us computer time if we want to check in. We have no plan for breakfast and decided to wing it for now. I get us checked out and load the bags. We decided that it would be best to just head towards the airport and find a place to stop along the way for fuel and food, not necessarily at the same place. I topped off the explorer and cleaned off the windows, the salt spray left behind each morning was starting to look pretty gross and it was making the side mirrors harder to view. Our timing was looking good and we found a local hangout called TL's. Breakfast and service was very good and we were set to go. The folks at Dare County airport are so nice. I had called for fuel at 8am while finishing up breakfast so that task would be scratched off the list. I unloaded the explorer, packed the plane and then completed my pre-flight. Winds favored runway 35 this morning so I opened up my Flight guide for a quick check of the taxiways and was ready to fire up 08Romeo. I plugged in our course on the Garmin 530 , tuned the Raleigh VOR as my back up nav and left the Garmin 496 with no plan but to just use for situational awareness. I like to cursor on airports for distance and heading as I fly always working a plan in my mind. 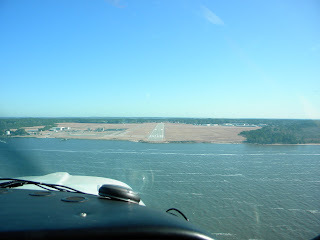 08R climbed out of Manteo and was ready to stretch her wings and I was too. The wx was so perfect for flying and after the Delaware winter wx this weekend was a welcome treat. I was soon turning cross wind and departing the area to the west for our one hour hop. Mary asked me if it felt cooler then normal as I was getting ready to check in with approach. She asked again and I reached over to pull the heat on and it was already on. Hmmm....I do feel a slight draft that's not the norm for 08R, she's really airtight. I check Marys door and then mine, it's open. Ugghhh, my door is cracked open! I immediately level off and decided to turn back to Dare County. I did attempt to close the door once and it's a no go so my focus is fly the plane, get back on the ground. I turn back for the airport, announce intentions and decide runway five is perfect. I come over the water and cross the fence for a nice landing and roll out clear of the runway. Ok, door shut and checked we taxi back for a second attempt at this flight. I announce our departure and start to roll. A check of the airspeed alive and a quick check on gauges green and I'm just about ready for wheels up. As I'm looking down the runway I catch a g limpse of two dogs crossing the runway as I am just ready to rotate. 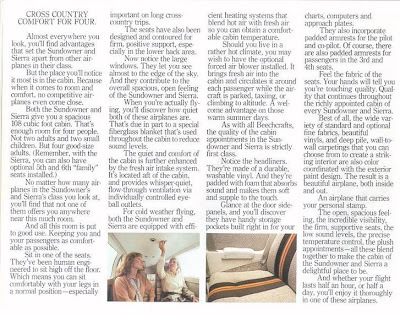 I focus on getting in the air and Mary said they both stopped in their tracks, thankfully no problems for either of us. Call me crazy but that's strike two in my three strike rule to flying for the day. The remainder of the trip is uneventful as we smoothly fly along listening to the xm radio country classics and taking in the view. As we approach Franklin County I copy the wx and listen for traffic on CTAF which I soon realize is shared with a few other airports. I announce my position and intentions about ten east and continue in noting the aircraft in the pattern on this clear sunny day. From ten miles out it was like watching bee's fly around the nest. I entered on a base leg which worked out great for spacing as I was number two behind a Cessna. Mary and I secured the plane, I had the tanks topped off and my Cousin Rob was there to pick us up, great timing. 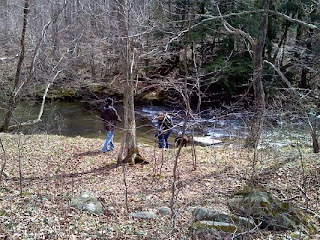 Rob asked about flying to Ashville for some fantastic fly fishing, I'm game if we can fly there! It was fun to catch up with family and to spend some time with my Mom's sister. Always such fond memories growing up and spending time together in Wilkes-Barre, PA. It's funny to look back and now see where we all ended up. Annette and Rob are grandparents, my aunt a great grand mom or as she is called Gmom and now with great grand children that call her GG. 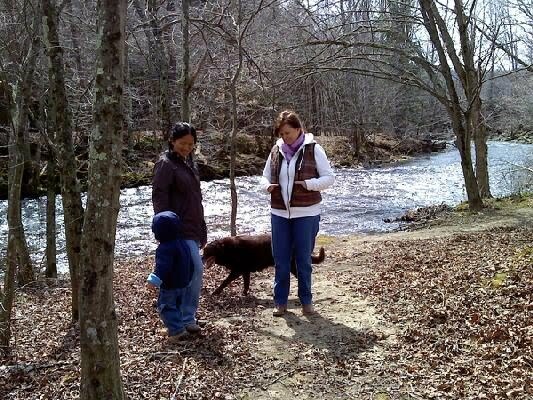 North Carolina seems so far from the little area of Plains township but life has treated them well and they are very blessed to have a nice home a great family. Since I am not night current we needed to get in the air in order to be home before turning into pumpkins or is that mice? (Beech Sundowner history joke there) We say our goodbyes, which is always hard, and make our way back to the airport. 08Romeo awaits our return like a faithful pup, knowing it's once again her turn for attention. A fuel sump and walk-around confirms all is in order so we load and a make for Wilmington. We manage to just beat the jump plane out loaded with meat missles and swap info on my departure route so everyone knows what everyone else is doing. I soon pick up flight following with Raleigh approach and advise my altitude and climbing for 7,500. 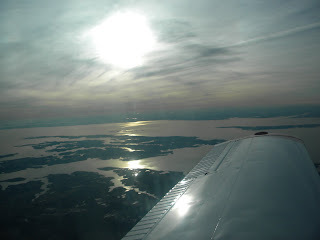 We make our way north east on the west side of the Chesapeake Bay opting to fly over patuxent and restricted area R4007 that has a 5000 foot ceiling. The view is gorgeous as we look east and see the mouth of the bay, Newport News and even the last island off the penninsula. We stayed with center most of the way and was handed off to Philly approach just north of Dover Delaware. I advised that I had current ATIS info and would like to cancel following at this time. I switched over to Wilington and advised 15 south with info inbound for full stop. The TFR had long passed and we were headed in. I was instructed to make a left base 27 entry, I acknowledged. As I turned base I was asked to keep my speed up to be number one to land followed by getting clearence. Great, or so I thought. The next call from the tower was proceed direct to the numbers. Never heard that one before and it certainly wasn't that busy to squeeze us in. The reason we practice I guess as I held off on flaps and kept 08R at best speed. As soon as I had the runway made I pulled power dumped flaps when I could and as I flaired lost sight on the runway with the wicked sun glare. I held it off but manged to plant it pretty good with a short skip that felt worse then it looked I'm sure. Once rolling I retracted flaps made for the first trun off "without delay" and cleared the runway. We were home! Monday I'm taking a day off to get 08Romeo's oil changed and to give her a much needed wash and wax. 6.5 hours flying this weekend and a fun time, we can hardly wait until Spring!